A retrospective of Throup's meticulously calculated trousers was presented in Paris for two days. 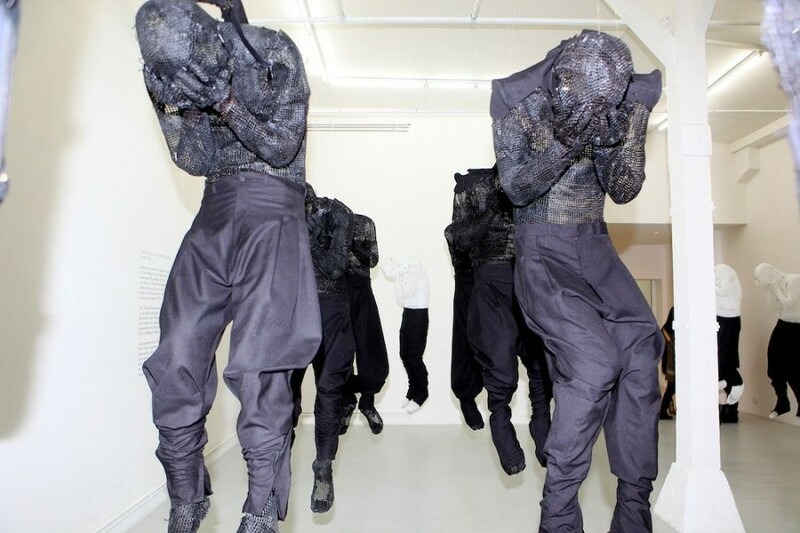 This weekend in Paris, designer Aitor Throup launched 'Legs', a retrospective of trousers designed from 2004 to 2010 by the Royal College of Art graduate and the result of six years of new object research. Throughout the Galerie Jean-Luc are Takako Richard stationary male forms moulded in thermoactive cotton mesh in rows from the ceiling, captured in vital movements of the human body. Throup has progressed chronologically through his archives, lifting a selection of designs from every six months and reinterpreting them with materials and design details appropriate to the season – and in doing so, has created an arena welcoming the expression of pure creativity and functionality. Capable of communicating a full-bodied narrative without proposing a complete look, Legs strives to elevate the status of trousers from over-saturated commodities to unique objet d’art. Throup’s series of trousers entitled 'The Funeral of New Orleans' is in particular a testament to the creativity and logic of his vision. Informed by the traditional funeral processions of New Orleans’ marching bands, it deals with concepts of body armour – each piece is formed onto a mesh sculpture of the human body created in the pose required to play each instrument, and the trousers demonstrate five exaggerated stages of shrinkage from when wool is exposed to water. It is clear that Throup’s designs exist beyond the tired parameters of fashion– they are meticulously constructed garments existing both within their narrative and without, made with respect for the human body and an astounding understanding of its formation. Dazed Digital: You know, I only know about your recent work – I couldn’t find out much about what you were doing two or three years ago. Aitor Throup: Oh, really? What actually happened is that I graduated from my Masters with the Hooligans collection, and that was quite creatively exhausting for me really because of every single little detail that was there. DD: At the same time, there was a kind of logic to it! Aitor Throup: A logic but mostly an explanation. It’s based on a kind of deeper definition of this obsession with masculinity or this masculine obsession with what’s traditionally function. But it’s not actually function – it’s reason. Fuction is a reason – if something has a function, that is why it’s there, right? – but I’m interested in exploring reasons beyond function, so something can have a reason because of a narrative or a concept, so [with The Funeral of New Orleans], it’s not a function but because it’s one pair of trousers systematically shrinking, with the same pockets, same waistband, same construction, you’re moving and increments and you’re setting something in motion and telling a story. There is a reason that trouser is 33% smaller than that trouser! DD: Is it really 33% smaller? Aitor Throup: No, I can’t remember what it is exactly right now. DD: Right. At this point I’m probably just going to believe everything that you say verbatim. This is unlike anything I’ve seen. Aitor Throup: That’s alright. There’s a mathematical term called parametric equation which is basically an equation that is – well – defined by parameters. So the parameters are predefined, and then the equation can be infinite if that’s what you want. So, for example there’s this new movement in architecture that is mirroring that. Architects might expand ceilings or floor sizes by increments, and so a building just begins to build up. What increments are you changing? Which side of the building is growing? DD: There’s such logic about all of your work. Is this something that has always been quite instinctual for you? Aitor Throup: I think being conceptual in fashion is really overused but our conceptual is about having confidence that you can justify and explain and having a narrative and I think that is something that is quite rare. DD: It’s similar to what you were saying earlier about how you can’t communicate all of this around us on a catwalk. Aitor Throup: Exactly, I don’t like the mentality of showing something for a very limited amount of time to a static audience that doesn’t get to choose the amount of time they look at the object or the angle from which they look at it. Me, I love my objects! There is a narrative built in them and here I can allow the viewer to be the active component rather than the passive component. It’s for them, you know. A video presentation of Aitor Throup's 'Legs' can be seen on his website.